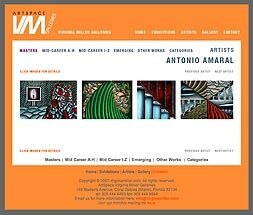 Several outstanding examples of paintings by leading Brazilian artist Antonio Amaral are on the gallery web site under Artists, Masters. Photographs can only indicate the subject matter of works by Amaral, whose astonishing range of intriguing techniques and subtle blending of colors always prove fascinating. One of the gallery’s new acquisitions, “Antagonic Fields or Fields of Opposites,” is an eight-foot 1992 canvas contrasting industrial smokestacks with layered fields of olive and rust that suggest crops. It appears to be bridging a series called “Greens and Smoke” and another major work, “Campo de Opostos,” illustrated in the monumental biographical catalog, “Antonio Henrique Amaral, Obra em Processo,” by Sullivan, Morais and Milliet.